The delightful bell-shaped flowers of campanula make a lovely addition to the flower border. These plants come in cool shades of white and blue and sometimes warmer pinks. They flower throughout the warm summer months providing a delicate swathe of colour. As they come in different forms there is a campanula suitable for most situations in the garden. Low growing varieties are good for pots and rockeries or with their bells dangling over walls or bed edges. The taller varieties look wonderful in the border. Campanula is easy to propagate and grow and is generally resistant to most pests and diseases, the exception being slugs and snails. Many types are perennials that are hardy in the UK, so they will come back to grace your garden with their delicate flowers year after year. Read on to find out how to grow and care for this delightful plant. 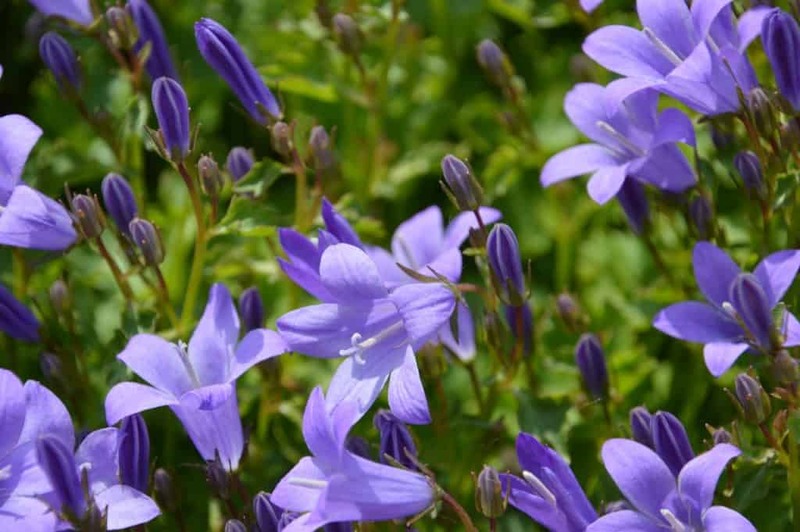 Campanula comes in both low growing, clumping and taller forms. The low growing varieties make good ground cover as well as being ideal for pots, raised beds and rockeries. The taller varieties are best sited in the middle or back of the border depending on their mature height. Most are perennials and come back year after year. Some varieties are annual or biennial and will seed themselves before dying at the end of a year or two. This variety is covered with masses of bluish-purple flowers throughout the summer months. It is ideal for growing over low walls and rockeries. This variety can tolerate some shade. As the name suggests this variety produces a carpet of foliage and flowers and is ideal as ground cover. It has large flowers in either white or blue. This trailing variety come in white or pale blue. It is ideal for containers and hanging baskets where its bells are able to dangle over the edges. This variety has long, hanging bells that are flecked purple and pink. It grows to about 30 cm (1 foot) high making it ideal for the front of beds and borders. This variety is biennial and has large bell-shaped flowers in shades of blue, pink or white. It reaches a height of 50 – 100 cm (1.5 – 3 feet). This pure white variety has long spikes of flowers and reaches a height of 50 – 100 cm (1.5 – 3 feet). Featuring abundant clusters of flowers in a similar way to hyacinths, this variety is a stunner. It comes in pink, white or blue and reaches a height of 1-1.5 metres (3-4 feet). This elegantly simple variety has single flowers in white and blue. It self-seeds around the garden and reaches a height of 90cm (3 feet). Campanula is easy to grow and care for. These plants are tolerant of most soils and not susceptible to many diseases. They are tough and hardy and will give you years of pleasure. Some varieties will also seed themselves around your garden. Most varieties prefer a warm sunny position. However, C. portenschlagiana (wall bellflower) will cope with some shade. Once established, campanula are reasonably drought hardy. However, to get the best out of your plant you should water it regularly when it is growing. It is especially important not to let them dry out when they are flowering otherwise you may lose blooms. They do not like sitting in wet soil, though, so water deeply once they begin to dry out rather than watering them often. Reduce watering when the plant is not actively growing. Campanula does well in most types of soil, even very acid or alkaline soils. However, it will do best in a light, free-draining but moist soil. You should avoid over fertilising these plants as this can lead to sappy growth that is more susceptible to slug and snail damage. You should look for a fertiliser that is higher in phosphorus than nitrogen as this will encourage flowering. You can also apply bone meal as this is a natural source of phosphorus. Container grown plants will need a regular application of liquid fertiliser in the growing season. Space your campanula around 40-45 cm (15-18 inches) apart, unless planting in containers where they can be packed in more closely. Plant your campanula so that the crown is around 2.5 cm (1 inch) below soil level. Mulch lightly to suppress weeds and help the plant retain moisture. Taller varieties may need light support. If planting in a container, use a loam-based compost with some added grit for drainage. You could also include some water retaining crystals to help them stay moist in dry spells. Canterbury bells require very little maintenance. However, dead heading will promote continued flowering. Dead heading self-seeding varieties is essential if you do not want them to spread around the garden. Your plant will need repotting once its roots fill its existing home. Choose a pot a few inches larger than the existing one. Use a loam-based compost with added grit. If your plant does not need repotting you should remove the top layer of compost yearly and replace it with fresh to add nutrients. These delightful plants are ideal for the cottage garden. Their gentle hues go well with most other cottage perennials. 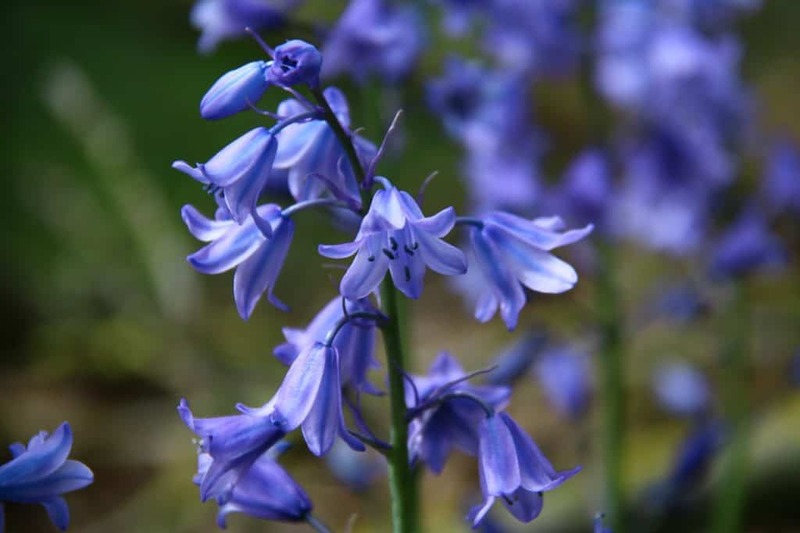 The low growing varieties have a trailing habit that lends itself to growing in pots and planters, in rockeries, or over low walls and raised beds where the bells can hang down in a very attractive way. All the different sized plants look good in the border, just check the eventual height before positioning them. Pruning campanula is not really necessary. However, you should deadhead regularly, pinching out the whole flowering tip to encourage new blooms. You should also remove any diseased or damaged growth. To maintain a nice shape, you can trim your plant back as necessary. Campanula can be propagated by seed in spring. The clump-forming plants can also be divided in the autumn or spring. You can also take basal cuttings in spring. In late summer, allow your campanulas to go to seed. They will produce seed pods. Once these become dry, break them apart and remove the seeds. Put these into a paper envelope and store them in a cool, dark place until spring. You can also leave your plant to self-seed. Seeds are also widely available in garden centres and by mail order. You can start your campanula seeds indoors around 8 to 10 weeks before you anticipate spring arriving. Use a moist potting mix in seed trays. Sprinkle the seeds evenly across the tray and cover lightly with more compost. Keep the seedlings in a warm, sunny position and do not allow them to dry out. Once the seedlings have two true leaves you can pot them on individually. They can be hardened off and planted out once the weather warms. You can also sow campanula directly into the soil once it is warm and all chance of frost has passed. Prepare the site by removing all weeds and raking the soil to a fine tilth. Sprinkle the seeds on the patch, rake over a light covering of soil and water lightly. Protect your seedlings from slugs and snails as these could demolish the seedlings. Keep the area moist but not waterlogged. You should see seedlings appear after 2 – 3 weeks. Seed grown campanula may not flower in their first year. If your plant has self-seeded, you may need to thin the seedlings or move them if they are growing too closely together. Propagation by division works well with clumping varieties. Carefully dig up your plant in spring starting around eight inches from its base so as not to damage the root system. Once you have removed the clump you can pull it apart into two or more sections depending on its size. If the roots are tightly packed, you can use a knife or spade to cut the plant into sections. Replant the divisions at the same depth and water well. Keep the soil moist until the plants have re-established. Basal cuttings should be taken when the earliest green shoots of your plant appear. Use a very sharp knife and cut down at the point where shoots emerge from the root system. You should ensure there is some solid, woody tissue as the base of the cutting. You can trim the leaves on your cutting by half to reduce the water stress on your new plant. Plant the cuttings firmly into moist multi-purpose compost. You should not use seed or cutting compost as this does not contain enough nutrients for these fast-growing cuttings. You can plant several cuttings in each pot. Cover the pot with a large plastic bag secured with a tie or elastic band. Place the pots in a bright, sheltered spot, ideally a greenhouse or cold frame but a windowsill will also work. The cuttings may wilt at first but keep them moist and they will soon recover. They should root in a few weeks, after which they can be potted up individually. Campanula is not susceptible to many pests and diseases with the exception of slugs and snails. Slugs and snails love to feast on the young fresh growth or campanula. You should protect your plant in early spring to make sure it gets established, otherwise, the snails and slugs might eat the whole thing before it has a chance to get going. Occasionally campanula may fall foul of rust disease. This will appear as orangey patches on the underside of foliage. If your plant is affected, cut it back to ground level and cover it with fresh compost. New growth will generally be rust free. In certain conditions, campanula may suffer from powdery mildew. This will appear as a powdery white coating, initially on the upper surface of the leaves though this may spread to the underside of the leaves and stems. You may also see yellowing and distortion of the leaves. Powdery mildew can be caused by dry soil and humid air around the top growth of the plant. Keeping the soil moist and promoting good air circulation can help. Remove any weeds from the surrounding areas as well as cutting back any plants that are encroaching on your campanula’s space. Watering at the base of the plant rather than from the top will reduce humidity. If your plant is affected, you should remove all infected growth and destroy it. A fungicide may be used if the condition is severe. Q I recently bought a campanula in a container. I have it indoors in a nice bright room, however, the purple flowers are fading to a very pale violet. What can I do to get that lovely purple colour back? Campanula is a plant that is not happy indoors even in a bright room. It needs to be out in the sunshine to do well. You could plant it out into a pot or windowbox if you have some outdoor space. Q I had plenty of green leaves on my campanula last year but no flowers. Why is that? Lots of foliage at the expense of flowers is often due to an excess of nitrogen. You may be using a fertiliser that is too high in nitrogen. Most fertilisers are a mix of phosphorous which strengthens stems and helps flower production, nitrogen which produces lush green growth and potassium, which keeps the root system healthy. When growing plants for fruit or flowers, you should use a fertiliser that is lower in nitrogen and higher in phosphorous. Many fertilisers have three numbers stated on the packet. You are looking for one in which the middle number is higher than the other two. Miracle Grow Plant Food would be suitable here. You could also apply some bone meal to increase the phosphorous and get the plant back to balance. Q My Canterbury bell did really well last year but there is no sign of it this spring. What can have happened to it? There are two possibilities. Firstly, you may have an annual or biennial variety. These plants only live for one or two tears respectively but usually self-seed before dying. The other possibility is that slugs and snails have polished off the new growth. Slugs and snails love the new growth of these plants, so they will need protection in early spring.